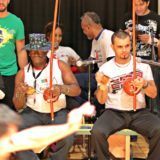 Chuvisquinho entered his first Capoeira roda in Belo Horizonte, Brazil. Not even born yet, he played Capoeira while his mother was expecting him as she practiced Capoeira as well. He was brought into this world already as a Capoeirista! The rhythms, movements, stories and songs of Capoeira were woven into Chuvisquinho’s being. He began practicing Capoeira movements around the same time he was learning to walk, and until this day he continues to perfect and refine the work and mission that he began as a child. In September of 1986 at the age of seven, Chuvisquinho received his first Capoeira rank ‘cordel’. Since that day he dreamed of reaching the limits and becoming a Capoeira Mestre. In his early teens he began teaching and imagined one day to have his own Capoeira school. In September of 1997, Chuvisquinho immigrated to the United States. Adjusting to life in a new country was challenging, but that did not weaken his passion for Capoeira. Along side with his father and following his family’s footsteps, Chuvisquinho taught Capoeira in various parts of Massachusetts. Still in high school he gathered students in the parks of East Boston with mission to share his passion for Capoeira with anyone that was willing to try. After many years of training and eighteen years after receiving his first cord, in October of 2004 Chuvisquinho received the contra-mestre rank in Capoeira, handed to him by his Mestre. This happened in the presence of many renown Capoeira Mestres. In April of 2006, Chuvisquinho began his own journey with his students in the Capoeira world. He is responsible for launching SINHA CAPOEIRA and its ideology of not just being another Capoeira group, but a Capoeira family. Today Sinha Capoeira is growing stronger and stronger year after year. A seed that was planted grew into a tree from which more and more fruit will be collected in the future. Now 30 years later Chuvisquinho’s dream has come true. With thousands of people introduced to this art form by him, and many students spread all over the world he is grateful to everyone that has entered Sinha Capoeira and helped this group grow stronger as a family. The day he received his first cord, the day he played Capoeira for the first time, he had no idea how many people’s lives he would touch and what a profound effect that these students and their families would have on his own life. On December 7th, 2014 in presence of his grandfather in Capoeira, Grao Mestre Dunga and many other honorable guests, Chuvisquinho received his Mestre cord.